Some souls are invested with extraordinary power to manage the universe. They are known as devas or demigods. Although they display godlike powers, they are not God. They are finite souls empowered by God to act on His behalf. Unseen by us, they control, among other things, the forces of nature. 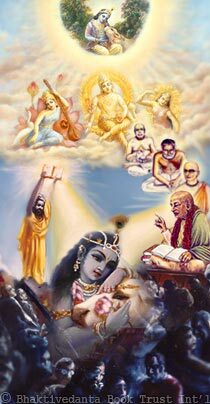 Throughout history, true lovers of God have acted as His authorized agents in this world. Some descend from the spiritual world, and others are empowered here on earth. According to time, place, and audience, they teach about God in varying degrees of complexity. Though their messages seem to differ somewhat, their goal is the same: to turn our attention back to God. By following their instructions, we can return to our rightful place in the spiritual world.